You may have noticed a new, un-photographed project that has shown up in the sidebar over there to the right with an intriguing title. Because this is exactly what I need - a hole in the head. Or another project, in this case. But, but, but...it's the Olympics! Today's the day! And Stephanie is on board again! How could I say no? 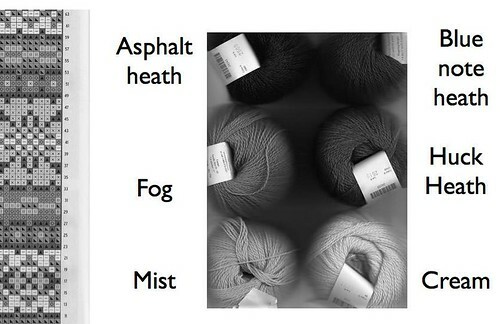 For the previous Knitting Olympics in 2006, I knit my first lace shawl, Adamas (pre-Ravelry, as if such a thing were even comprehensible anymore!). I was not successful, but it was the first lace thing I'd ever done, and I got most of it done during the Olympics, so it was a good experience. This year, I've decided to tackle a project that has been on my list for a long time - the Ivy League Vest. 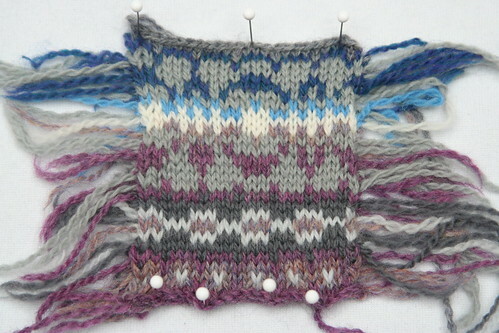 Here's why this is a challenge for me: I have a serious Fair Isle/colorwork planning block. The knitting of this will not be a problem, and I've done steeks once before, so that's not a huge deal, but I despise don't really care for the colors used in the original. And figuring out which colors look good together is not my strength. So I knew that I wanted to do different colors, but it was a huge inertia block for me to actually do the work to figure out how to change them. 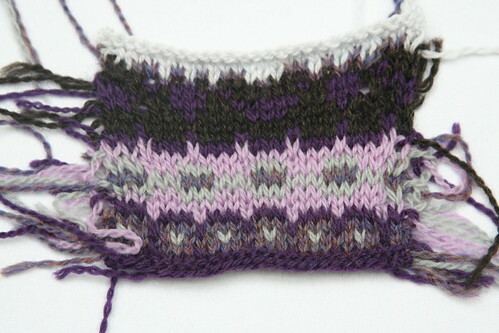 This swatch was knit on US 2/2.75 needles using Ash, Clematis Heather, Mist, Fog, Lipstick and Cream. Stitch gauge, 7 stitches per inch, color combo, ick. At this point, it was 11:30 on Sunday night, and it was well past time for bed. Except that I went to bed and lay there for an hour obsessing about colors and what should go where, and so on. Silly Porpoise. Since IM was away, I found myself downstairs at 1:00 in the morning scanning black and white images of different colors of Palette. Because I seem to remember reading somewhere that an important issue in colorwork is contrast. And if you're substituting colors, it will come out better if you get similar contrast values between your substitutions and the originals. These contrast values are easiest to see in B&W. I also realized that the pattern uses two colors in each of three families: white, tan/brown and green. Green was out, and I'm not so taken with the tan/brown option. Whites, fine. Tan/brown became greys and green became either purple or blue. The grays down the left side will be ok, but the navy was too dark. The observant among you may realize that this is none of the combinations that I meticulously scanned. I decided to try a purple version (with Huckleberry Heather and Iris Heather) and a blue version (with Pool and Blue Note heather). This swatch was also done on US 2/2.75 mm needles, but my final gauge came out at 8 stitches per inch, so I think I'll be going with a US 3/3.25 mm needle. I like these combinations much better then the ones I first started with. So the B&W option was very helpful in narrowing things down. 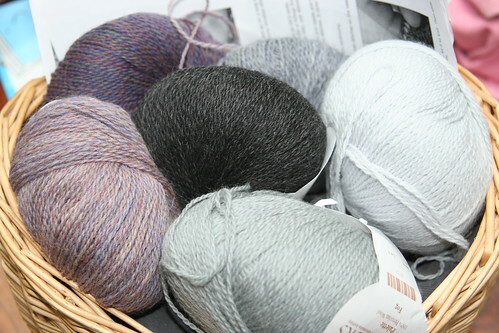 I've got my needles ready to go - some lovely bamboo circulars* - and I will be casting on as soon as the girls go to bed tonight** with these yarns. 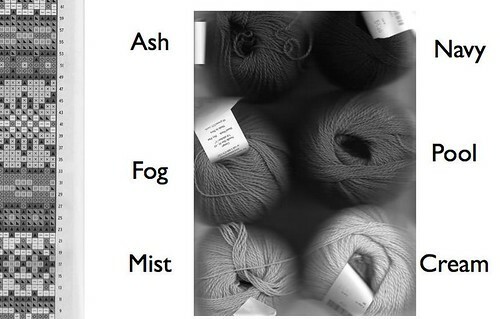 Clockwise from lower left: iris heather, clematis heather, marble heather, mist, fog (now called silver apparently) and asphalt heather in the center. There's got to be a little bit of mystery in this, right? * I'm hoping to be able to get this project on to the plane for our trip on Monday - that's three hours knitting time right there. ** I realize this is not kosher. However...the Opening Ceremonies will be starting at something like 1:00 am Saturday for me. That's the loss of an entire, unencumbered evening's worth of ribbing. And given that we leave at 8:30 Monday morning for seven days half-term holiday in North Africa, I feel that missing out on this chunk of time will doom me from the beginning. So...I will aim to finish by the same time minus half an hour on the 28th (the Closing Ceremonies start 30 min earlier then the Opening Ceremonies). 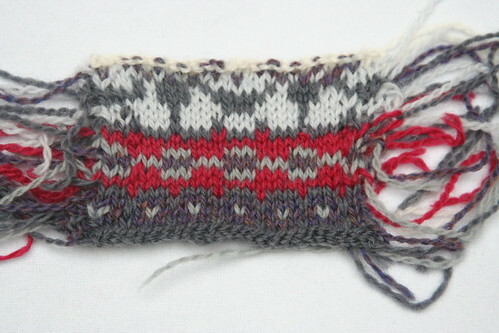 Written by porpoise On February 12, 2010 In "Knitting Olympics", "colorwork", "swatching", "vest"